How to convert JPEG to SVG format using VBScript? With Print2Flash it is easy to convert any JPEG documents to SVG format using VBScript. 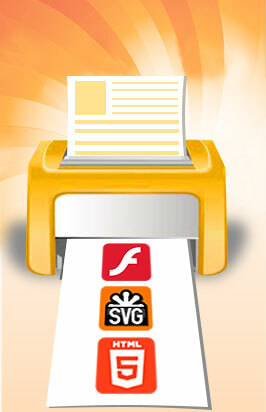 To convert JPEG documents to SVG programmatically, you may use Print2Flash OLE Automation API. You may get a sample demonstrating how to use Automation API for converting with VBScript from Print2Flash SDK. You may use this sample to build your own website or application for converting JPEG documents to SVG. Download and install Commercial Edition of Print2Flash from the Download page. Download Print2Flash SDK archive from the same Download page. Unpack SDK archive to disk to a separate folder. Open Automation\VBScript folder of the SDK and follow sample installation and usage instructions located in the ReadMe.htm file from this folder.